Hope, you are quite well and daily practice for Competitive examination like, ssc,wbssc,upsc,wbcs,ibps,fci,ib,rail, bank, police, primary, school service etc. Primary TET exam is comming soon. Most of the students waiting for wb primary examination. So are looking for some model question paper for primary examination? Here is the best place for you. 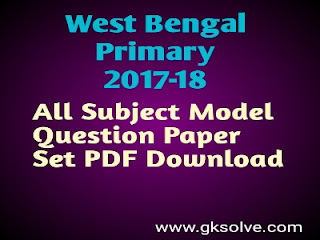 Today GK solve share All subjectwise Model Question Paper set for you.You can download this pdf file just one a click and free of cost.Model Question set help you better practice and also you know about the exams pattern.So this is most important pdf file for you.Download West Bengal Model Question Paper set 2018 pdf file as soon as possible and Start practice. GK Solve help you every day to give all competitive Exams Study Materials, pdf book, job information etc.If you help from the blog, please Share the blog address with your friends circle. Dusclaimer : GK Solve is not owner of this pdf file.This link is also available other site on Internet.